As so many of us do, I love letters and type. I’m particularly fond of unfussy utilitarian typefaces such as the adhesive letters that you can find at office supply stores. 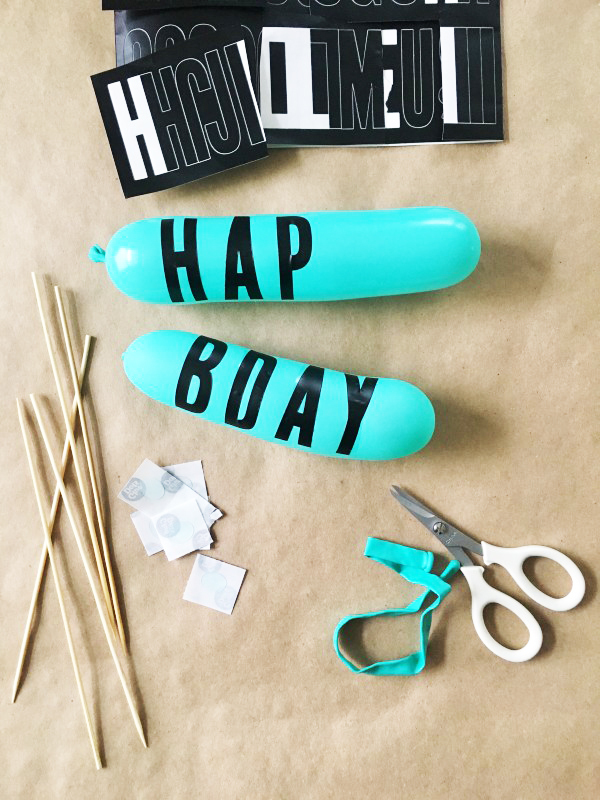 I am sharing a few quick party ideas using these stickers on some basic items you already have, like balloons, bags, paper, and glasses! 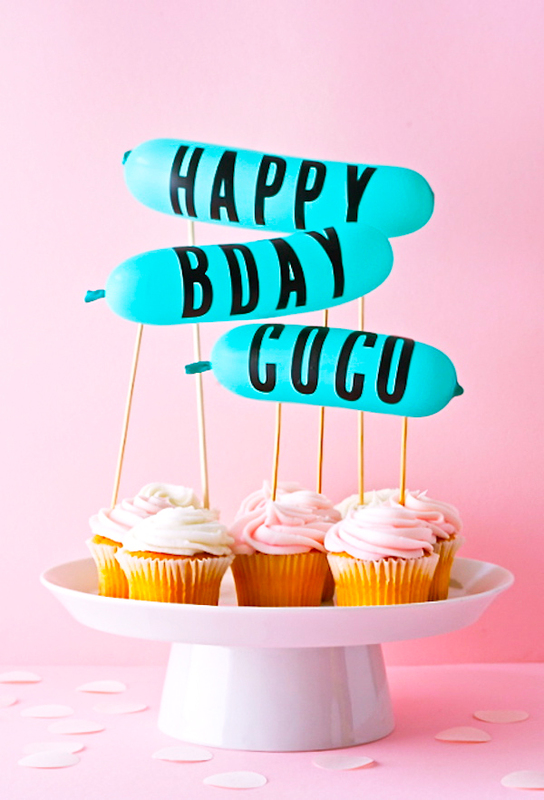 Use sticker-ed balloons for garlands and cake toppers! The garlands can serve as signs to direct your guests to food and drinks. 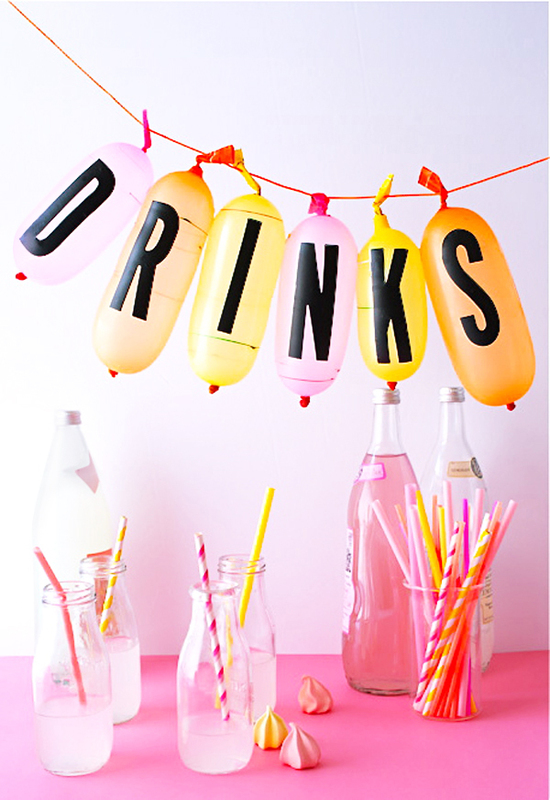 This DRINKS garland was made on “rocket” balloons which have a fat hot dog shape and look great with tall condensed letters. 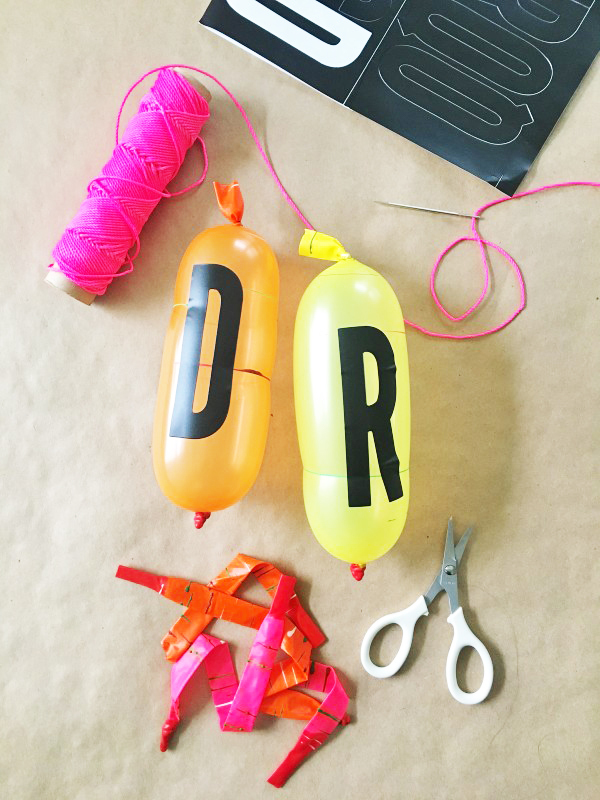 step 1: Inflate the rocket balloons part way, tie them off, and snip off the excess with scissors. step 2: Thread the needle with twine and cut the string to your desired length. Pierce through the flap above the knot and string all the balloons on, spacing them out as you go. step 3: Adhere sticker letters to each balloon. Hang your garland! 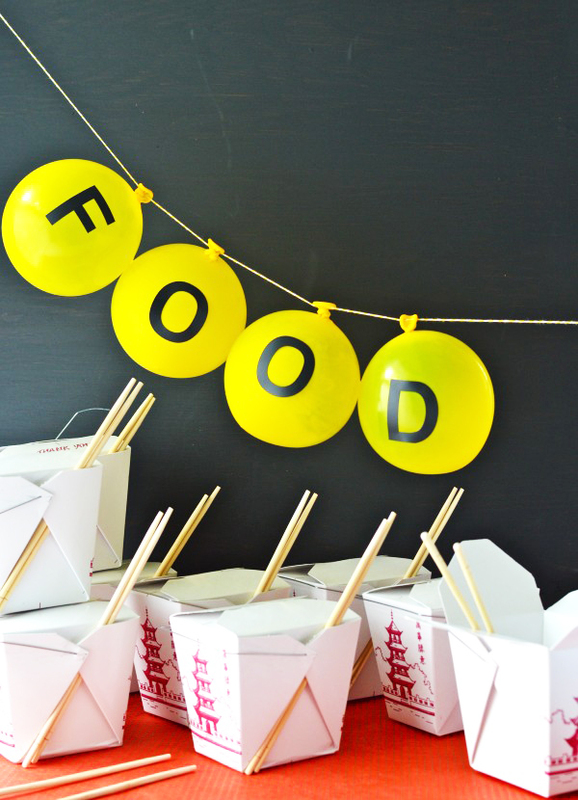 This FOOD garland can be made with mini balloons or partially inflated regular 11″ balloons and adhesive letters such as these. Tiny water balloons can be strung up between two skewers for a quick cake topper! Adhere a balloon to another skewer with an adhesive dot for an additional topper, as on the orange ‘5’ balloon. 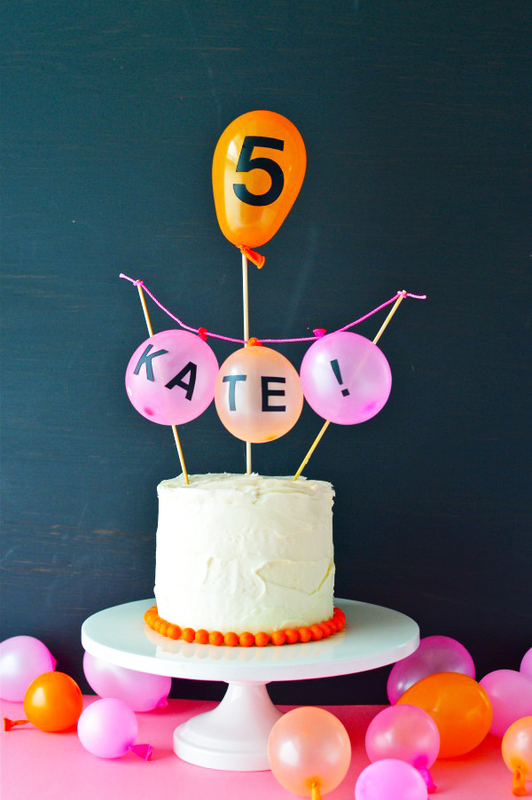 Use twisty balloons and adhesive letters for a multi-tiered cupcake or cake topper! step 1: Inflate the balloons part way, tie them off, and snip off the excess with scissors. step 2: Decide on your balloon arrangement and cut down the skewers accordingly (two skewers for each balloon/word). For this arrangement, I cut three pairs of skewers to three different heights. Use adhesive dots to adhere a skewer on each side of the balloon. step 3: Adhere sticker letters to each balloon. Poke into your cupcakes or cake! If you’re having a (blind) wine tasting party, you will have to cover the bottle’s labels. To make a bottle slipcover, use adhesive numbers on a strip of heavy paper, wrap it around the bottle and double-stick tape it closed at the back. 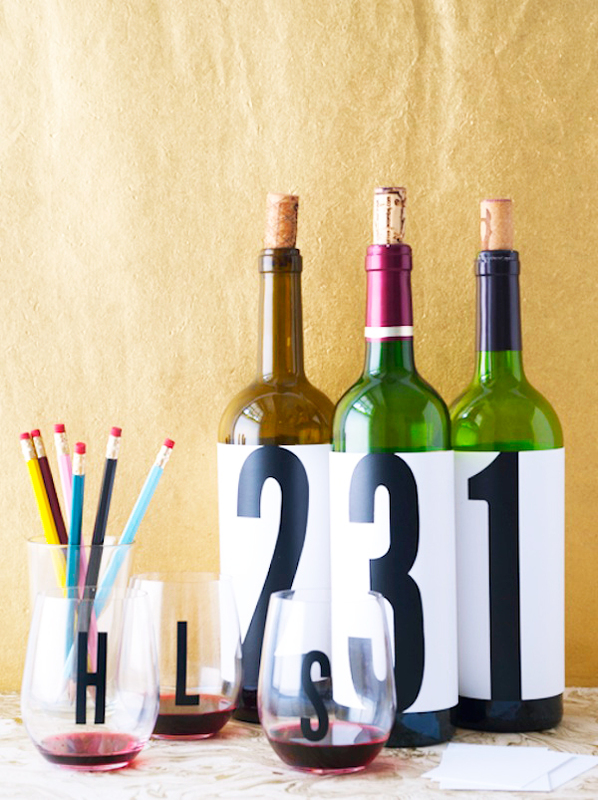 The numbers will help guests keep track of their tasting notes. And for *any* party, adhesive letters on glasses are a great way to help guests keep track of their drinks! For my kid’s parties, I like to personalize the favors. It’s a nice touch for guests but also lets me keep track of anyone that forgot to take one home! 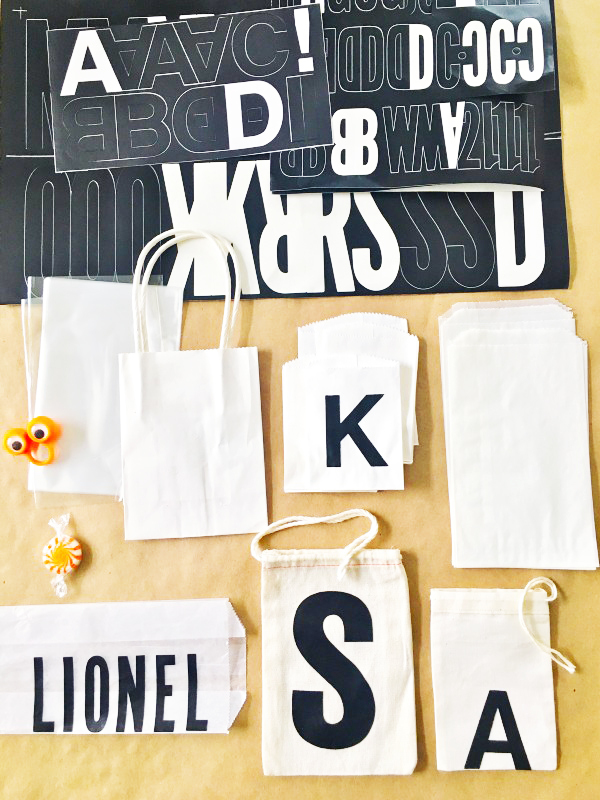 Adding a sticker letter, either an initial or a name, is a fast way to personalize any kind of favor container like this assortment of bags, including glassine, cellophane, cotton, and paper. 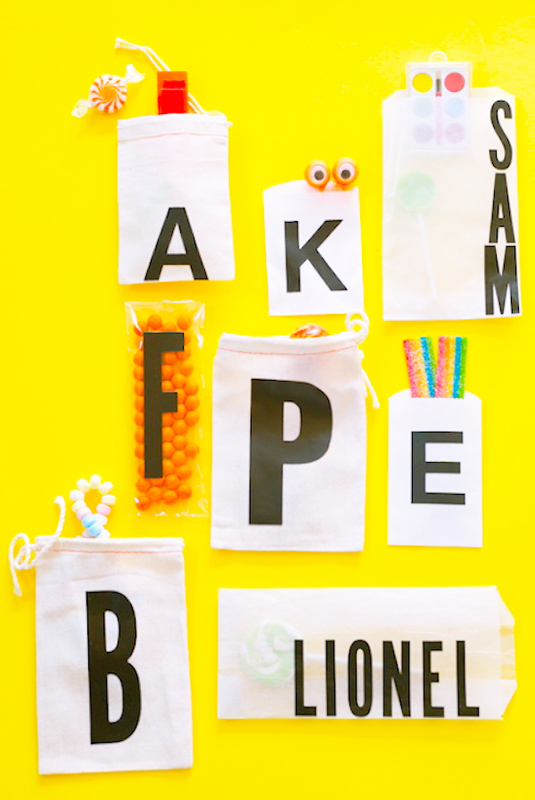 There are infinite uses for adhesive letters, especially for parties. Happy letter-sticking! I love this!! Such an easy, creative idea! This is a brilliant idea, and how cool those letters look on a bottle and glasses! I love the idea of hosting a wine tasting party and using these stickers to mark the bottles!